How do you learn Scrum? By doing it! Scrum theory can be explained quickly on the back of a notepad. But that does not help you to understand what an agile mindset can bring to your organisation and why. 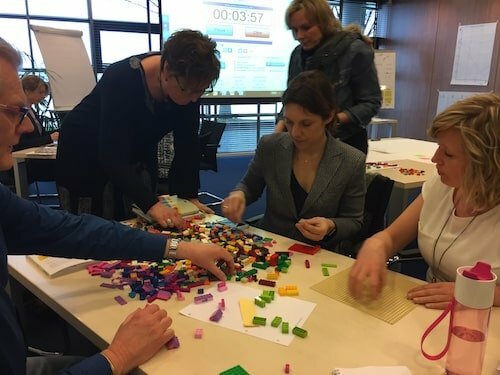 So when the Boxmeergroep – network of about 40 Human Resource Development (HRD) professionals in the Netherlands – asked if I could initiate them in Scrum, I suggested to play with Lego. Lego4scrum is an interactieve way to experience the importance of agility and the power of Scrum. And on top of that, it is fun! In a simulation of about 2 hours, participants are asked to design a tourist island in front of the coast of Nicaragua. The product owner explains her wishes. The teams determine how to get things done. And they get to work! Thanks to this simulation I am starting to love Scrum! After the game, the group reflects on their insights and the application in their own professional practices.